I don’t know about you but I LOVE SHAMROCK SHAKES. So much. When I was in college, I would anxiously await their return to the McDonald’s menu and then, before I had any care about ingredients, would purchase at least one a week until they were again removed from the menu almost a month later… YIKES. Now that I have more knowledge about nutrition, I would never again purchase a McDonald’s Shamrock Shake, but that doesn’t mean I can’t have a nutritious, tasty alternative! 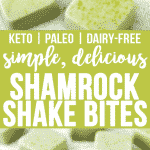 These Keto Shamrock Shake Bites are not only virtually carb-free, they are dairy-free, paleo-compliant, and SO DELICIOUS! 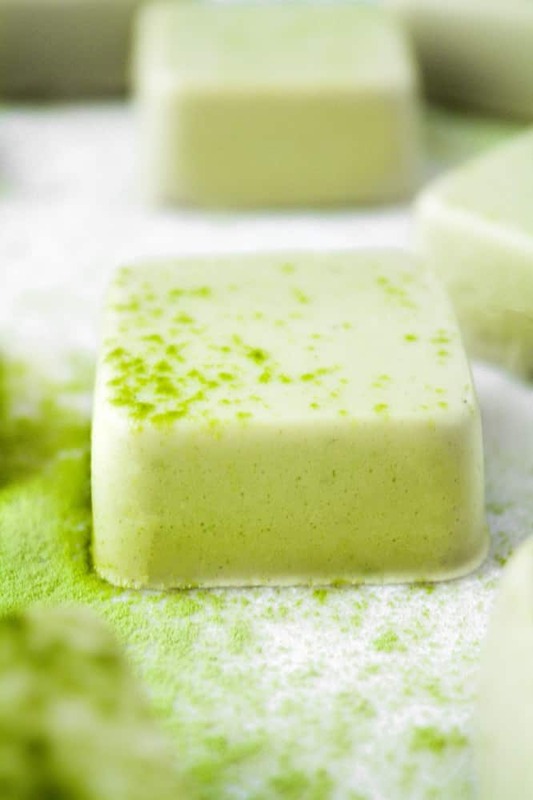 Made with matcha green tea powder, gelatin, peppermint extract, and sweetened with monk fruit sweetener and vanilla protein powder, these Keto Shamrock Shake Bites are simple to make and taste just like their sugary counterparts, without all of the weird ingredients! 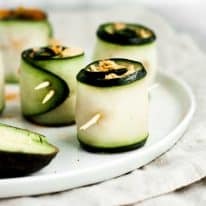 In this recipe, I use unflavored gelatin to give the Bites their shape. The gelatin is completely flavorless and allows for the Shamrock Shake Bites to solidify into bite-sized gummies. This is a required ingredient in this recipe and I personally prefer this brand. 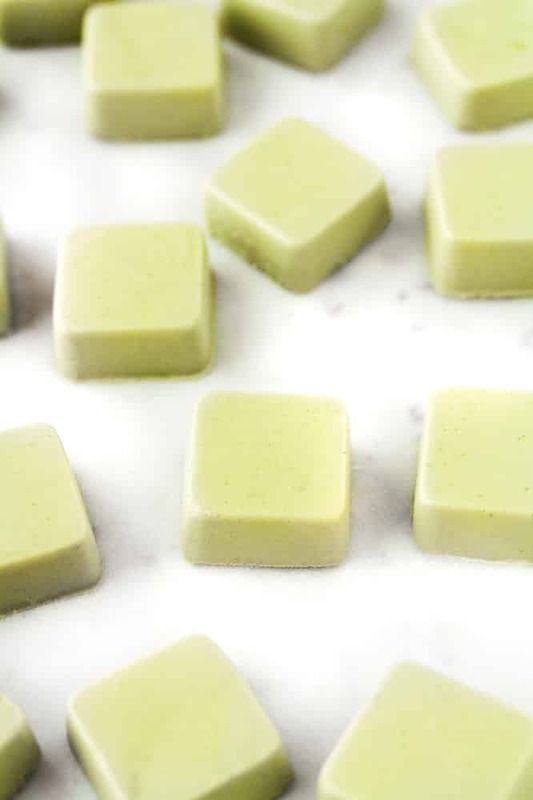 Low-Carb/Keto: Minimal carbs in these Shamrock Shake Bites (0.2g net carbs per serving), unlike that of a McDonald’s Shamrock Shake. Even a small sized McDonald’s Shamrock Shake has a whopping 74g carbs! 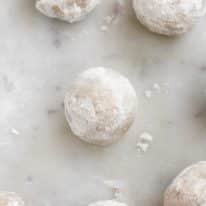 Paleo: This recipe is made with clean, paleo-compliant ingredients (free from gluten, grains, dairy, or soy). Dairy-Free: Almond milk is utilized in this recipe in place of traditional dairy milk. To make this recipe nut-free, coconut milk can be substituted for almond milk. 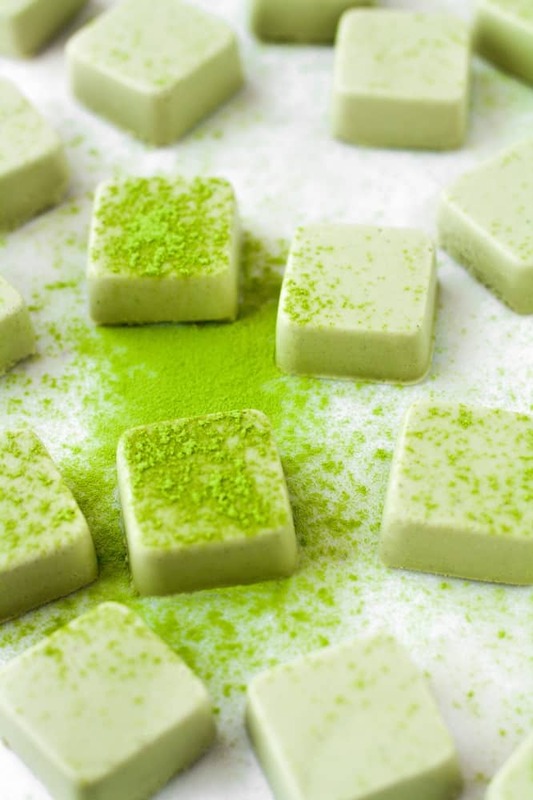 Refined-Sugar-Free: These Keto Shamrock Shake Bites are sweetened with monk fruit sweetener. One Keto Shamrock Shake Bite is only 0.2 grams net carbs! 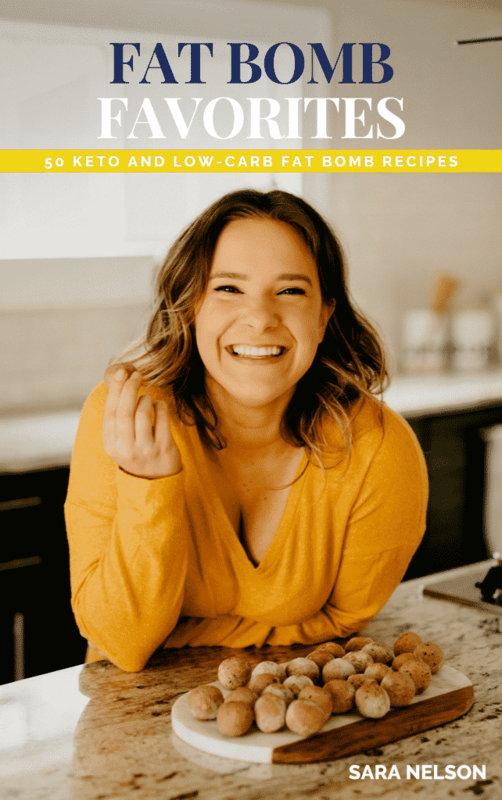 This recipe is keto, low-carb, paleo, dairy-free, nut-free, gluten-free, grain-free, and refined-sugar-free. These Keto Shamrock Shake Bites are simple, delicious, and keto-friendly! 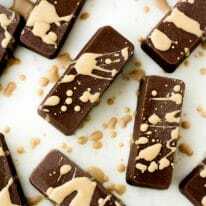 This recipe is low-carb, keto, paleo, dairy-free, nut-free, gluten-free, grain-free, refined-sugar-free, and only 0.2g net carbs! To mixing bowl, add 1 cup almond milk and sprinkle gelatin on top. Set aside to set for 5 minutes. In small pot over medium low heat, heat remaining 1 cup coconut or almond milk until steaming. Remove pot from heat and pour heated milk into gelatin mixture and whisk until well-incorporated. To blender, add gelatin mixture, coconut butter, protein powder, monk fruit sweetener, matcha, peppermint extract, and vanilla extract. Blend on high speed until all ingredients are thoroughly mixed. Pour mixture into silicone mold and transfer to refrigerator to chill until solidified, about 2 hours, before popping bites out of silicone mold. It is far too moreish! I even halved the amount of sweetner and it took all my self control to offer my children to rescue me from eating the whole jar full alone. I don’t know if it was the quality of my matcha and peppermint extract but the taste was a little weak. Next time I’ll add a bit more of those and a little more sweetener (I used sukrin gold since monkfruit isn’t available wher I live). That said I liked them, both taste and texture! Thanks for your comment, Emma! 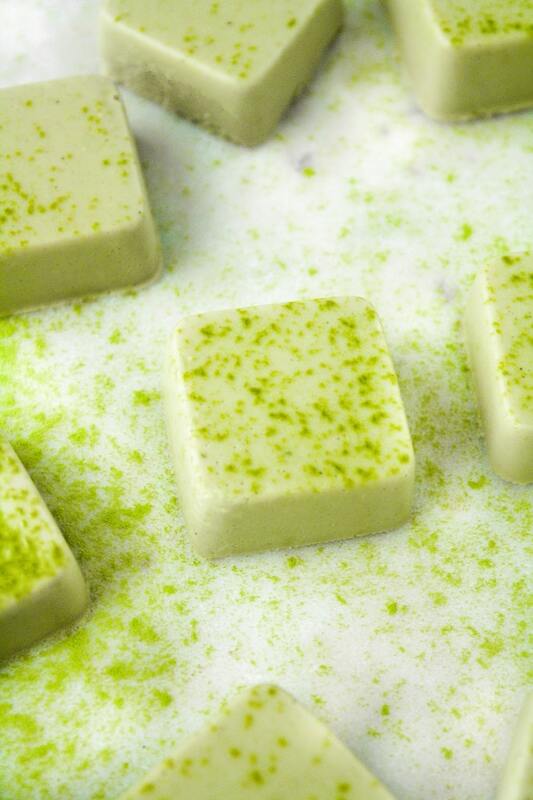 I find that the higher quality the matcha, the more flavorful. 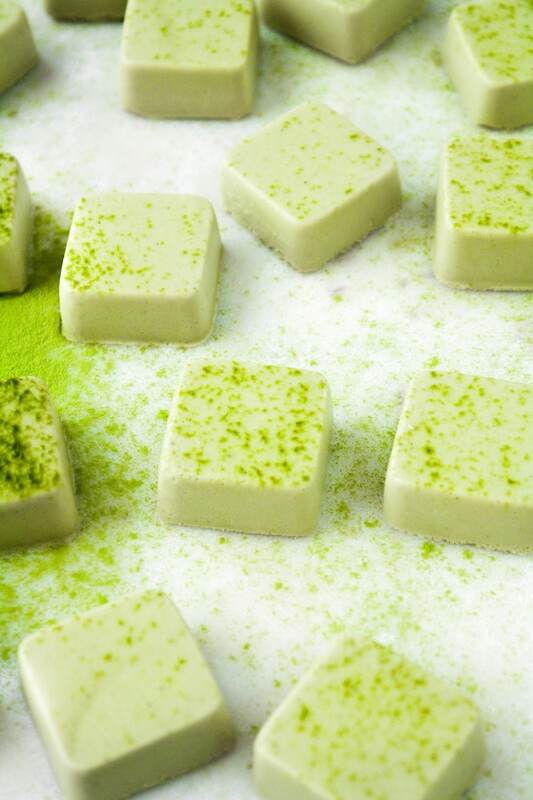 Sometimes the cost of ceremonial-grade matcha is totally worth it! 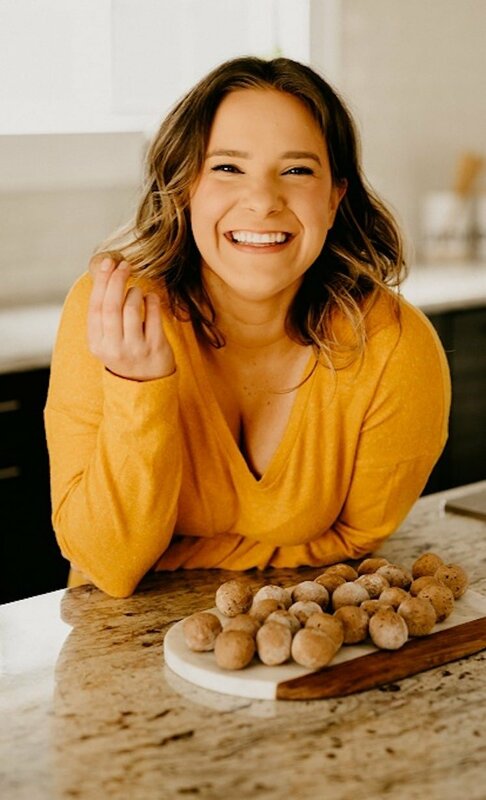 Happy to hear you enjoyed the recipe!